ALUNAR 3D Desktop Printer made of high-quality parts quality and is a brand you can trust! while using environmentally-friendly practices to produce top-notch 3D printers. The ALUNAR 3D Desktop Printer is engineered to provide redefined usability, quality and performance while being affordable. With its high-speed quiet design, the 3D printer features are easy to control producing high precision smooth printing. and also a YouTube guide link is provided. We make it so that you can get your 3D printer up and running as quick as possible! 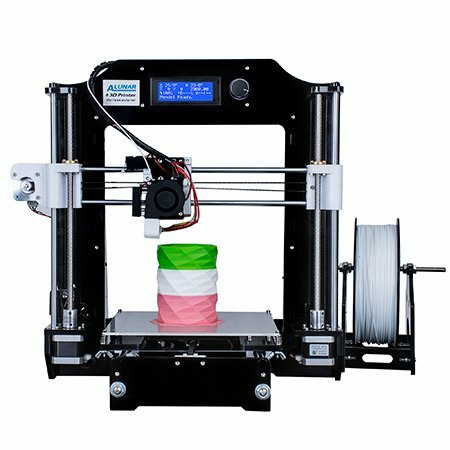 Support many 3D Filament Types: The heated build plate and wide range of extruder temperatures allow this printer to work with many types of 3D filament, from basic filaments, such as ABS and PLA, to more advanced materials, such as conductive PLA, wood ...etc.，support many colors for 1 item. Excellent Quality Performance: LCD screen to display; easy control by 5 keys; customized good quality extruder;4 stars lead screw brass nut & high import lead rod; high quality step motors(without interruption for 1000 work hours);updated main board, more function support; high quality power supply; free 3D filament and spool holder along with the 3D printer package. Compact Desktop Design: Mini desktop 3D printer. Featuring a small footprint and basic, open frame design, this 3D printer is compact enough for any desks. Worry Free Customer Service: Buy with confidence. Easy return and refund if you are not satisfied with our 3D printer. With professional technical engineer to solve the problems you may face when using the 3D printers.